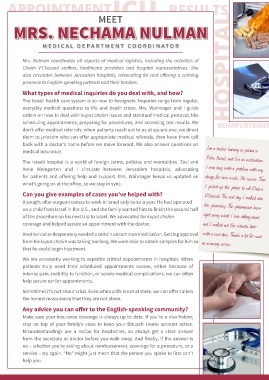 presence to English-speaking patients and their families. Eretz Yisrael, and I’m on medication. what’s going on at the office, so we stay in sync. from his kupat cholim was taking too long. We were able to obtain samples for him so   an amazing service. that he could begin treatment. the honest reassurance that they are not alone. Any advice you can offer to the English-speaking community? stay on top of your family’s visas to keep your Bituach Leumi account active.